ST. EUSTATIUS - The Chairwomen of the First and Second Chambers of the Dutch Parliament paid a working visit to St. Eustatius Sunday. During their visit First Chamber Chair Ankie Broekers-Knol and her colleague in the Second Chamber Khadija Arib met with members of the Island and Executive Councils at The Old Gin House, where numerous topics were discussed. Some of these topics concerned the strained relation between the Governments of the Netherlands and Statia, the financial situation of the island, the quality of governance, Statia’s quest for more autonomy, and the yet to be published report of the Committee of Wise Men. Leader of Progressive Labour Party (PLP) Clyde van Putten said although the meeting at times was tense, yet he considered it to be “constructive and meaningful.” He said the Statia Government had restated its willingness for dialogue based on mutual respect and equality. The Dutch delegation expressed serious concern about the breakdown of communication between both Governments, and stated that they had hoped that the relationship would have improved with the new Dutch Government that just took office. Van Putten stated that “his” Government has “always expressed and shown willingness for dialogue with the Dutch Government,” but told the delegation that this must be done based on mutual respect and equality. Van Putten told the delegation that the present Government was elected in a “free and fair election” and is executing a programme that was approved by the Island Council. 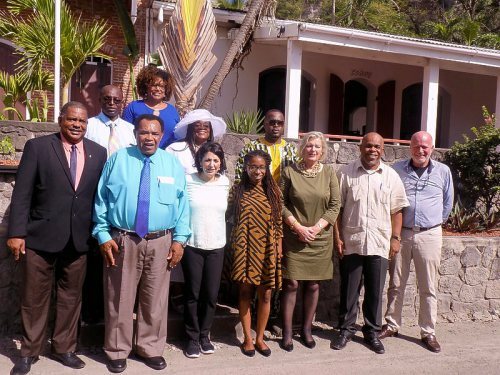 Group photo of the visiting Chairpersons of the Dutch Parliament’s First and Second Chambers with members of the Executive and Island Councils, with leader of Progressive Labour Party (PLP) Clyde van Putten (second right). Regarding the constitutional quest of the present Government, Van Putten said this is the major bone of contention between the Governments in Oranjestad and in The Hague. “This is a mission of no return considering that the people of the island did not vote for the present constitutional status, and in the articles of the United Nations Charter a full measure of self-government is what Holland signed to in 1952/1953 for these islands,” the Councilman said. During the meeting, Van Putten highlighted many improvements that took place regarding public finances and the quality of Government administration. “We will not stop, until we reach the level for which we set out to achieve,” he had added. Regarding the island’s non-participation and cooperation with the Wise Men, Van Putten said this was done because the Netherlands went back on an agreement closed between Statia and then Minister of Home Affairs and Kingdom Relations Ronald Plasterk. Van Putten said that Refunjol had refused to sign the budget into law after it was approved by a majority in the Aruban parliament, “under the instruction of the then Minister of Kingdom Affairs. The second reason for not communicating with the Wise Men, Van Putten said, was that the Dutch Government had unilaterally changed the agreement that Statia and the Netherlands were each to nominate a Wise Man. Instead, the Dutch appointed both members, Van Putten said.